Cameron’s high school graduation, (our oldest son). He attends Grand Canyon University and loves it. Eric and I celebrated our 22nd wedding anniversary in Coeur d’Alene, ID in June. Our family enjoyed a vacation in Whitefish, Montana and visiting Glacier National Park in July. We spent our time hiking, mountain biking, ziplining, and viewing some beautiful scenery. God has graciously blessed our family in many ways, for which I’m grateful. He has also led me into some new ministry terrain that is challenging and rewarding at the same time. As you reflect on this past year and set your sights on new horizons, I hope and pray that God makes His will clear for you and that you see his hand at work in your life. We can trust God in the year ahead, for he has good plans for our future. The following Bible verses, shared by Mary Fairchild, are grounds for excitement! This passage describes a transformation that will eventually lead to the full enjoyment of eternal life in the new heavens and new earth. Christ’s life, death, and resurrection introduce followers of Jesus Christ to a foretaste of the new world to come. Christians aren’t perfect. The more we grow in Christ, the more we realize how far we have to go. We can learn from our mistakes, but they are in the past and need to stay there. We look forward toward the resurrection. We keep our eyes on the prize. And by maintaining our focus on the goal, we are pulled heavenward. Both discipline and perseverance are required to accomplish this objective. 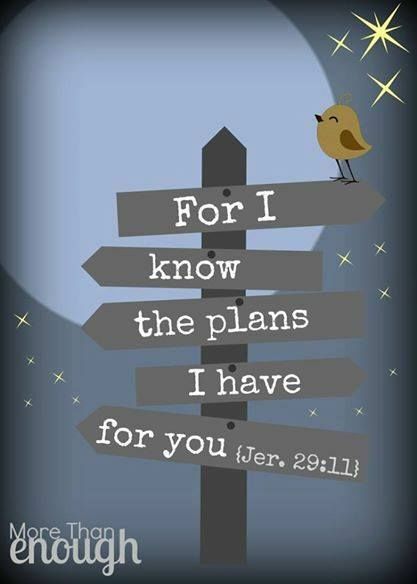 This entry was tagged "I know the plans I have for you" Jeremiah 29:11, 1 Peter 1:3; 2 Corinthians 5:17: Ezekiel 36:25-27; Philippians 3:13-14; Psalm 37:7; Isaiah 40:31, A NEW CREATION, A NEW HEART, Christianity, FORGET THE PAST - LEARN FROM MISTAKES, God has good plans for His children's future, Happy New Year!, NEW BIRTH - A LIVING HOPE, WAIT ON THE LORD - GOD'S TIMING IS PERFECT. Bookmark the permalink. Happy New Year. With God as our Leader, may we be prepared to live another year under His guidance.God Bless. Thank you, Karina. Many blessings to you this year!